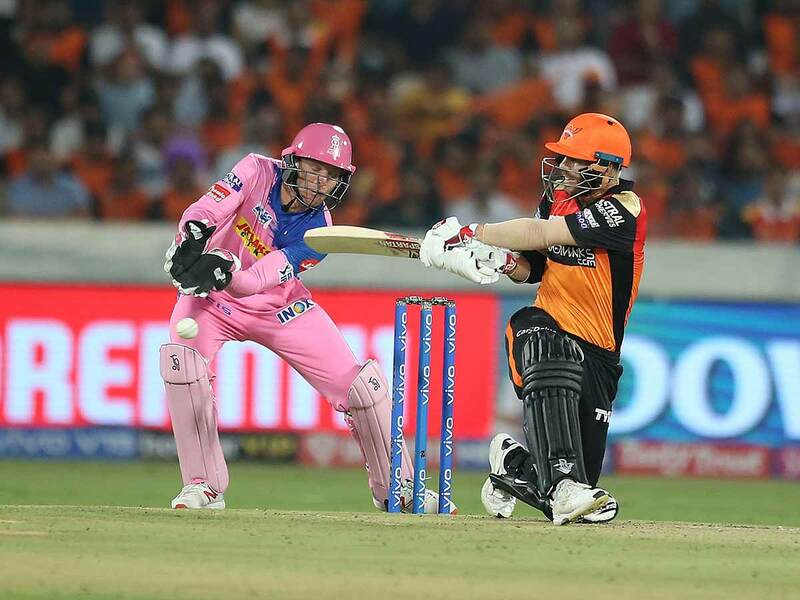 Hyderabad: Whirlwind half-century by David Warner, coupled with cameos from Vijay Shankar and Rashid Khan, helped Sunrisers Hyderabad (SRH) beat Rajasthan Royals (RR) by 5 wickets in a thrilling Indian Premier League (IPL) contest here on Friday. Chasing a stiff 199 for victory, Warner (69; 37b, 4x9, 6x2) set the platform for Sunrisers along with Jonny Bairstow (45; 28b, 4x6, 6x1) before Royals reined in with some timely wickets to take the match down to the wire. Vijay Shankar (35; 15b, 4x1, 6x3) did his World Cup chances no harm by keeping Sunrisers in the hunt with some lusty blows, but with 12 needed off 12 balls, Rashid (15*, 8b, 4x1, 6x1) spoiled a brilliant 19th over by Jofra Archer whom he smashed for a four and six to win the game for the hosts with one over to spare. Royals’ Sanju Samson, who earlier slammed this season’s first century, was left high and dry as Sunrisers completed their highest ever run chase. Warner gave Sunrisers a flying start as the hosts raced to 69/0 after the Power play. Returning to action after a year-long suspension due to his role in a ball tampering row, Warner brought up his 38th IPL fifty off just 26 balls. Warner and Bairstow added 110 runs for the opening wicket before Ben Stokes cramped Warner for room with a well-directed bouncer which the southpaw pulled down the throat of Dhawal Kulkarni at the fine leg boundary. Bairstow followed suit soon after Kulkarni made amends for dropping the England stumper-batsman on 44 with a sharp catch at long-off off Shreyas Gopal. Vijay Shankar and skipper Kane Williamson (14) looked to continue from where the openers had left, with the former playing the aggressor’s role to perfection. The duo stitched together 47 runs for the third wicket before both were removed in back-to-back overs by Jaydev Unadkat and Gopal, respectively. New batsman Manish Pandey (1) was trapped in front soon after with Sunrisers needing 32 runs off 28 balls. Yusuf Pathan (16*) and Rashid Khan then joined hands to take their team over the line. Earlier, Royals rode on Samson’s brilliant unbeaten hundred to post 198/2. Samson (102*; 55b, 4x10, 6x4) notched up his second ton in the competition while Royals’ skipper Ajinkya Rahane too cracked a fluent half-century (70; 49b, 4x4, 6x3) to help the hosts recover from a slow start. The pair added 119 runs for the second wicket. Samson, who brought up his ton in the 20th over by hitting Bhuvneshwar Kumar for a four, made the most of a reprieve when he was dropped by wicketkeeper Bairstow on 58 in the 17th over by smashing Kumar for 24 runs in the next over (6-4-4-2-4-4). In the last over, Stokes (16* off 9) came to the party by smacking Kumar for two successive fours to get the home team close to the 200-run mark. Samson and Stokes were associated in a 64-run third wicket partnership which came off just 25 balls. Bhuvneshwar (0/55) went for 43 runs in his last two overs as Royals scored 76 runs in the last five overs. Royals lost Jos Buttler (5) early when the in-form England batsman tried to sweep Rashid Khan (1/24) only to lose his leg stumps in the process. Rahane and Samson then took time to get going as the visitors could only manage 75/1 at the halfway stage. But from there on, both batsmen accelerated at brisk pace and after Rahane departed in the 16th over, Samson took the Sunrises bowlers to the cleaners.